What Colors Mixed Together Make Sage Green? Sage-green, the color of dried sage leaves, is a quaternary color composed of citron and slate. Citron is a mix of orange and green, and slate is a combination of purple and blue; quaternary colors are blends of two tertiary colors, and each tertiary color is either a primary hue and a secondary hue or two secondaries. If that isn't confusing enough, try mixing colors to get the perfect sage-green paint. Or just grab the paint chip at the hardware store, take it to the counter, and get a sample to test on your walls. 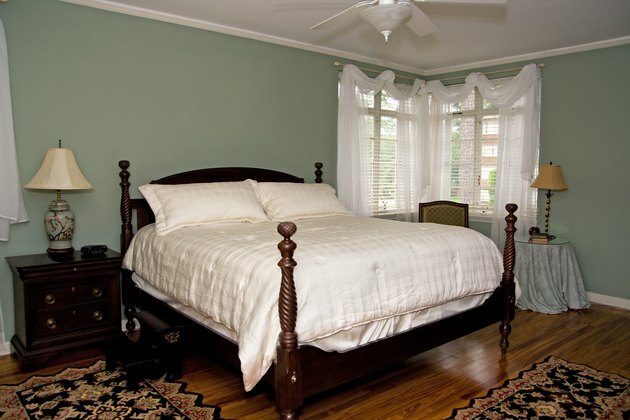 Sage green walls create a restful bedroom. The herb sage has been used for millennia to lower stress and fevers, reduce inflammation and tension, improve concentration and relaxation, and control excessive sweating. It helps you to chill. It cools down a room as well, with serene color that is easy on the eye and on your decor scheme. But sage is a little more complex than it appears. Citron, a kind of citrusy-yellow, is a combination of yellow-orange and yellow-green. Slate, a subtly variegated stone color, is blue and blue plus purple, or blue-violet. Put them together, and instead of mud, you get sage. Sage-green is a bit livelier than simple sage because it has more citron in it. Sage-green is such a chameleon that you can use it with different shades of all the hues that are in it without a color clash. Paint living room walls sage-green and hang floor-length rose-colored silk drapes lined in apricot. Cover the conversation area, or the entire hardwood floor, leaving only an 8-inch border, with an oriental or Aubusson carpet in shades of sage-green, pine, pink, cream, gray, slate and citron. Risk a pair of upholstered club chairs in muted citron -- citron with some black added to it to lower the intensity -- and cover the sofa in soft, true sage velvet with a mix of pillows in yellow-green and olive tattersall, violet, slate and flowered pink and sage-green. A jade vase of tiger lilies on the coffee table is a tribute to your color confidence. Sage flows as effortlessly as water through adjacent rooms; it looks at home in the dining room, the kitchen and the hall. In a kitchen with blond wood cabinets, vanilla walls and trim, paint the base of the kitchen island and the wall leading to the dining room sage-green. Then paint all the walls in the dining room sage-green with vanilla trim, ceiling and drapes. The hallway outside the dining room mirrors the vanilla ceiling and sage-green walls and opens into a living room with a predominantly sage-green oriental carpet, vanilla walls, trim and ceiling, and sage-green linen sofa. Sage-green is a fairly bright color, enlivened by the green in it, but its low saturation relaxes your eyes and emotions. A color has low saturation when it is far from a pure hue, and sage-green is a very elegant mongrel. When the sage-green paint you have doesn't look quite how you imagined it would on the bedroom walls, adjust it a little. Less is more when remixing colors, so experiment with just small color additions at a time. To lighten sage-green, add white to it. White doesn't make a dramatic difference right away -- you'll have to add it incrementally until the color matches your preference. Remember that paint dries darker on the wall than it appears in the can. Flat finish dries lighter than eggshell or gloss, because matte absorbs the light; shiny paint bounces light away, revealing the paint color more strongly. If your sage-green is too bright, lower the wattage very carefully -- and just a little -- by adding tiny measures of black paint. If you'd like a more intense sage-green, try adding more green.